We all love shopping on eBay, don’t we? We shop because eBay gives us many choices, many sellers, feedback, discounted price and what’s more – the most loving part which is coupon codes. eBay regularly sends us coupon codes which in turn entices us to buy more by applying that coupon code. It’s not just about buying, but it’s about smart buying. These tips will help you buy that much desired thing on eBay the smart way and save more bucks. Don’t get enticed by deals on the homepage. Yes, it’s your right to get enticed but there’s no need to hurry. It’s not just about what they highlight on the homepage, but it’s about finding the best deal. Here’s a statistics – deals on the homepage get more sales compared to the deals that are never highlighted on homepage. Some users open eBay, click on that deal from the homepage and purchase it right away. No, please don’t do this, as who knows we can find a better deal by searching. That’s why we have a “Search” function. Do you like that product and are attracted its super low price? No problem. But before clicking on that highlighted product, try out searching for that same product. Let’s take an example of iPod Touch 4G. I got 45,926 results. Now let’s narrow the search by clicking on “iPod and MP3 players” from the “category” on left side. Again, I got 2108 results. Choosing a single listing from all these is a tough task. So what now? Now’s the time to “sort” search results. In the “Sort by” drop down box, select “Price + Shipping: Lowest first“. That was a smart move. But there’s one more important thing. Don’t waste time selecting from so many listings and sellers. On the left side, we can see “refinements“. E.g. 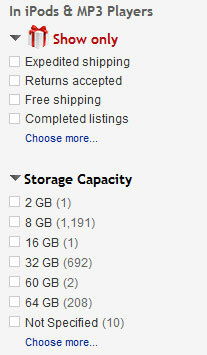 if you’re searching for only 8GB iPod Touch, then why see results related to 2GB, 16GB, 32GB, etc. Remove the clutter by clicking on 8GB. All the listings that were more, or less then this storage capacity will be removed and you will get results of only 8GB. So in short, remove unnecessary options from the listing and refine it. This should make it easier and convenient to choose one from thousands of listings. Now that if you’ve finalized on one listing, it’s time to go in detail. Learn all you can about that listing. Read the description in the listing carefully. Check whether the item condition is new or used. Is shipping details clearly mentioned? Some sellers list the product with an attractive price but increase shipping and handling charges. Yes, some seller do this dirty trick, that’s why its important to check the listing carefully. If there are more than one product images are provided, then check all those photos and you can even enlarge them. If you want more product images, then you can also email the seller and ask about it. If you still have any doubts about the product, then click on “Ask a question” link and write in detail about all your queries. There’s no harm in asking questions to sellers. Check if the seller has money back guarantee and if exchanges are accepted. It’s also a good idea to check sellers feedback. Feedback are a reflection of seller’s standing, previous sales, sellers behavior and speed of shipping. If the seller has got negative feedback then take some time and read those feedbacks. Anything above 96% can be an indication that seller is good. There are bound to be some negative feedback in this online world, as some people may have more expectations. There are some customers that are difficult to be handled and they may give negative feedback for no proper reason. Those who are not comfortable with “Buy it now” price, then they can find some other listings which are “auctions”. You can place bid with the best price which will increase the changes of winning the bid. But don’t bid too high or you will need to pay for that overpriced product. Bidding on products is addictive but keep in mind about the actual price of that product in the market. Sometimes bidders pay more for the product, compared to product’s market price. Don’t do this, be smart and stop bidding at such times. We certainly don’t want to pay more, do we? If you win, then you get a notification from eBay. Pay for the product and it is your’s now. After receiving the item, now is the time to give honest feedback about your experience with the seller and the shipped product. Positive: This means that your shipping experience was positive and most likely you will buy again from that seller. Neutral: Your shopping experience had some issues with the sale process that you can live with. So instead of giving a negative feedback, you gave neutral. Negative: This means you had a bad shopping experience. You are disappointed on how things went. But before giving negative feedback and harming seller’s reputation, its better to contact the seller first and seek a resolution for the matter. Many issues can be solved by this way. If still the matter is not solved, then leave an honest feedback, as to what exactly the problem was and why you gave negative feedback. Sellers care much about negative feedback and most likely they will be willing to solve the issues before such a situation arises. We want the best products with the best prices. Hope these tips helps you to shop smartly on eBay and save money. Have a happy shopping experience !